jmtd → log → which spare laptop? I'm in a perpetual state of downsizing and ridding my life (and my family's life) of things we don't need: sometimes old computers. 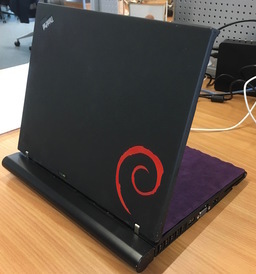 My main (nearly my sole) machine is my work-provided Thinkpad T470s: a fantastic laptop that works so well I haven't had anything to write about it. However, I decided that it was worth keeping just one spare, for emergencies or other odd situations. I have two candidate machines in my possession. Toshiba Portégé R600. I've actually owned this now for 7 years, buying it originally to replace my beloved x40 which I loaned to my partner. At the time my main work machine was still a desktop. I received a new work laptop soon after buying this so it ended up gathering dust in a cupboard. It's an extremely light laptop, even by today's standards. It compares favourably with the Apple Macbook Air 11" in that respect. A comfortable keyboard, but no trackpoint and a bog-standard trackpad. 1280x800 16:9 display, albeit TN panel technology with very limited viewing angles. Analog VGA video out on the laptop, but digital DVI-D out is possible via a separate dock, which was cheap and easy to acquire and very stowable. An integrated optical media drive which could be useful. Max 3G RAM (1G soldered, 2G in DIMM slot). Thinkpad X61s. The proportions match the Thinkpad X40, so it has a high nostalgia factor. Great keyboard, I love trackpoints, robust build. It has the edge on CPU over the Toshiba. A theoretical maximum of 8G (2x4) RAM, but practically nearer 4G (2x2), as the 4G sticks are too expensive. This is probably the "heart" choice. The main drawback of the X61s is the display options: a 1024x768 TN panel, and no digital video out: VGA only on the laptop, and VGA only on the optional dock. It's possible to retro-fit a better panel, but it's not easy and the parts are now very hard to find. It's also a surprisingly heavy machine: heavier than I remember the X40 being, but it's been long enough ago that my expectations have changed. Surprising myself perhaps more than anyone else, I've ended up opting for the Toshiba. The weight was the clincher. The CPU performance difference was too close to matter, and 3G RAM is sufficient for my spare laptop needs. Once I'd installed a spare SSD as the main storage device, day-to-day performance is very good. The resolution difference didn't turn out to be that important: it's still low enough that side-by-side text editor and browser feels crowded, so I end up using the same window management techniques as I would on the X61s. What do I use it for? I've taken it on a couple of trips or holidays which I wouldn't want to risk my work machine for. I wrote nearly all of liquorice on it in downtime on a holiday to Turkey whilst my daughter was having her afternoon nap. I'm touching up this blog post on it now! 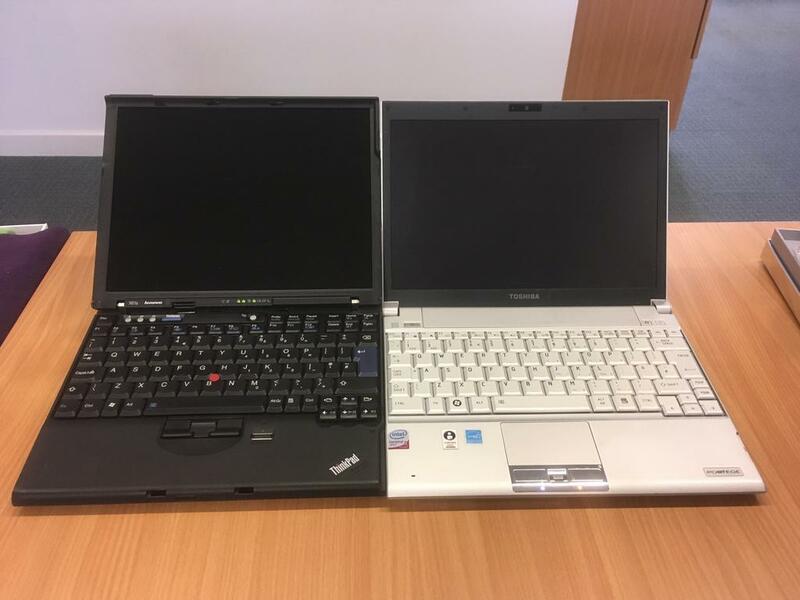 I suppose I should think about passing on the X61s to something/someone else. I really liked the look of those 51nb hacked laptops, and if I was to buy one I would go for the x61s form factor. I was put off by the cost, availability issues and the lack of information about Linux support. Matthew Garrett has since made a lot of progress on the latter point. Actually, you can buy an X260 as a main laptop, and buy another X260, as spare. Both are cheaper in eBay, and you may not buy 50% of new one with the amount of money you this two incredible laptops. The X260 looks quite nice, although I fell out of love of the X series around the X201. Even cheap it's more expensive than not spending any more money (since I already own the Toshiba). However I did waste some money on the X61s last year. My main laptop, not mentioned in this post, is a T470s.